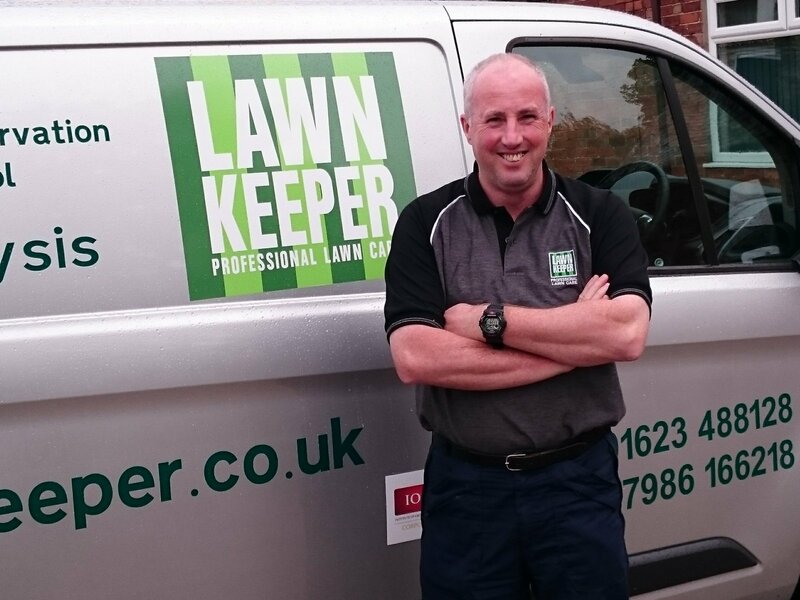 My name is Paul Turner and I operate Lawnkeeper North Nottingham. I cover the following areas (please call me if you’re not sure this includes you! ): Nottingham areas: Sherwood, Arnold, Carlton, Calverton Gedling, Burton Joyce, Ratcliffe on Trent, Bingham, Car Colston, Saxonadale. Newark areas: Newark, Winthorpe, Claypole, Long Bennington, Southwell and surrounding villages, Flintham, Elston, Lowdham, Lambley. Ravenshead, Mansfield and Ashfield areas and Hucknall. I have 25 years’ experience as a qualified greenkeeper/groundsman working with all types of fine and amenity turf. As your local lawn care professional my role is to deliver a reliable and friendly service. No two lawns are the same, so after carrying out a detailed lawn analysis, I will explain what is required to improve the quality and appearance of the lawn, and how to keep it healthy. All products used are environmentally approved and are applied with professional equipment. Feed & weed treatments – providing the right fertilizer and weed control over different seasons of the year. All fertilisers are slow release to give an even balance of nutrients over the year. Aeration – to relieve compaction, promote stronger root growth and improve drainage, ideal on heavy soils. Scarification – to control the build-up of thatch and moss, which will lead to helps the grass become healthier and stronger. Disease control – helps control lawn diseases like red thread and fusarium. Moss control – to help prevent and manage the control of moss. Due to wetter winters moss is becoming more of a problem, Lawnkeeper can put together a programme for your lawn that will help reduce the risk of moss being a problem. Pest control – the control of chafer grubs and leatherjackets (crane fly or daddy long legs), these can cause serious damage to your lawns, by eating the roots, causing the grass to die off in patches and birds trying to feed on them. Hard surface moss control – Treat your driveways, paths and patios with a moss, algae cleaner. Hard surface weed control – we can treat hard surface areas such as driveways and paths for grass and weeds. Wetting agents – to help with the retention of water through the soil profile to the roots, especially useful on dry sandy soils. Growth retardant – Helps to improve root development, thicken the turf and reduce the frequency of mowing. Over seeding – Rejuvenate a tired lawn and bring it back to life.